50% Off one art plate or setup fee for first time customers. We offer disposable, as well as reusable cup options. We require a 5,000 cup minimum order and provide 4 color spot PMS print capability offering full coverage color custom printing and 4-color process print capabilities. 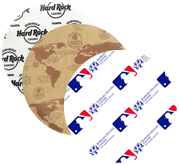 We offer over a dozen different customizable food service papers for food packaging. Most of our food service papers have a 1-3 case minimum order requirement, and offer 2 spot PMS color printing. 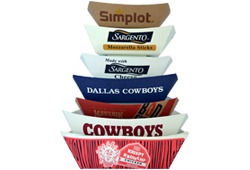 These versatile custom printed paper Food Trays are available in both white and Eco Kraft brown. With nine different sizes to choose from, our custom printed Food Trays are the perfect fit for any size food service project. Our line of custom printed Fry Scoop Cups have a high-gloss or matte outside finish for both hot and cold food applications. 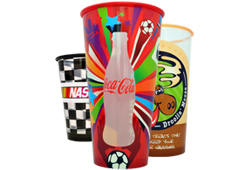 They are printed in Hi-Definition, full-color to give you the best impression on a disposable paper cup. 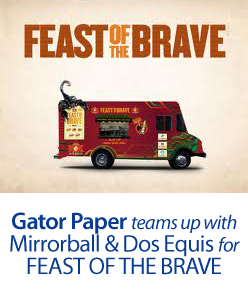 Gator Paper is the #1 source for all your custom printed Food Service Product needs. Take advantage of this powerful form of brand identification without breaking the bank! Gator Paper carries a few different printed and unprinted To Go Boxes in multiple sizes. We offer a few different colors, including, white, black, Kraft brown, and a Golf theme version. 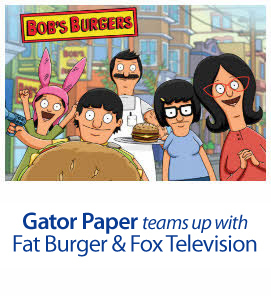 Gator Paper is the #1 source for all your custom printed Food Service Product needs. We specialize in custom printed Deli Paper, Sandwich Paper, Cheese Paper, Cushion Foil, Napkins, Cups, Bags, Food Containers, Fold Top Boxes, Food Trays, Labels & Stickers, Plate Liners, Placemats, Tissue Paper, Fry Scoop Cups and much more! Take advantage of this powerful form of brand identification without breaking the bank! We offer the lowest minimums in the country on all of our custom printed products! Let us help you develop your “brand” design or advertising concepts into custom packaging reality. From concept to delivery, Gator Paper is the short run custom printed food product leader. 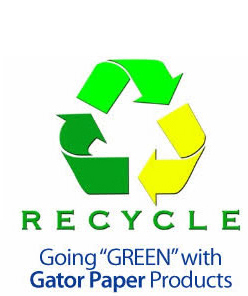 Did you know that Gator Paper products were used in the 2008 & 2010 Olympics? We also supply custom-printed products for various professional & collegiate sports teams, including the New York Yankees, Philadelphia Phillies, Kansas City Chiefs, Iowa Cubs, University of Kansas, Iowa State University and many PGA Tour events to name a few. Customer satisfaction and product quality is our #1 priority! Custom printed Fry Scoop Cups are now available in full color and full coverage printing with minimum orders starting at just 1,000 pieces. Scoop up the extra Branding Impressions with our Hi-Definition custom printed Fry Scoop Cups. Available in both Hot and Cold paper, these unique food service items are sure to leave a lasting Impression with your customers! 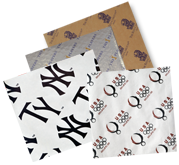 Gator Paper is the leader in short-run custom printed food service wraps and liners. Harness the power of branding your company name or logo in the most economical way possible. Our custom printed food service papers make quite an “Impression”. 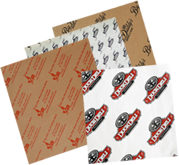 Browse our food packaging papers such as Sandwich Paper, Deli Paper, Butcher Paper and Brown Kraft Paper of all types. 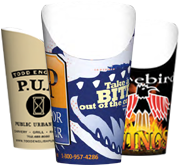 Gator Paper offers a wide variety of custom printed napkins. 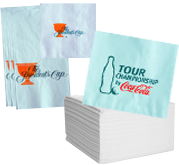 We specialize in branding your company name or logo on Beverage Napkins, Luncheon Napkins, Dinner Napkins and Paper Linen Napkins. Custom printed napkins make a great first impression. We offer up to 4 spot PMS color printing with minimums starting around 10,000 pieces. 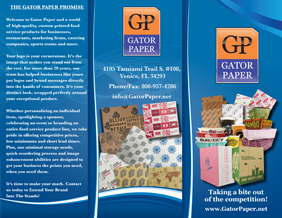 Gator Paper offers a wide variety of Custom Printed Cheese Paper. 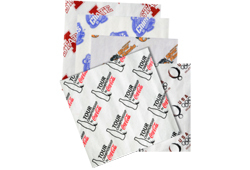 With a polyethylene coating, our 1-ply cheese paper is perfect for wrapping all types of cheese. Offered in white or brown kraft, our paper allows cheese to breathe while retaining the appropriate level of humidity to ensure freshness and safe storage. Whether you own a cheese shop, or retail store, we have you covered! 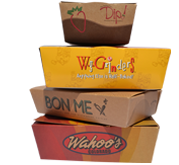 Gator Paper offers a wide variety of Custom Printed Food Service To-Go Boxes. Our custom printed To-Go Boxes offer the ability to brand your company in a unique and powerful way. With low minimum requirements of just 10M per size, and full coverage printing, Gator Paper can help your branding message reach far outside the box! 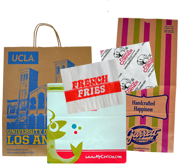 Gator Paper, the leader in custom printed food service supplies, now offers custom printed Food Service and Retail Bags of all sizes and colors. Our specialty is short run bags! 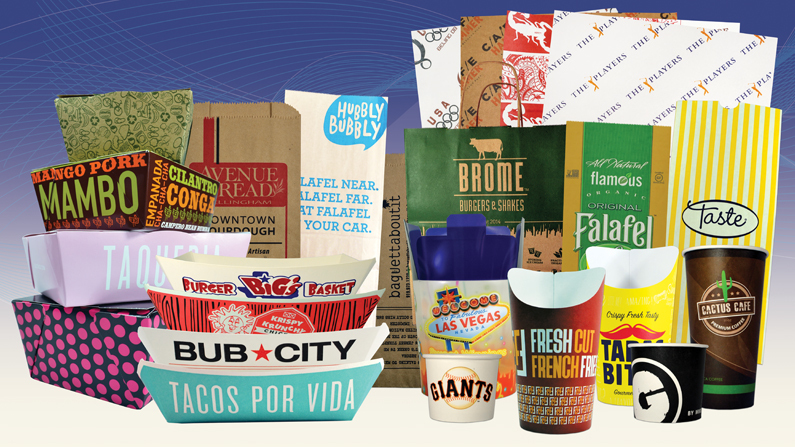 Whether you are looking to offer your movie goers popcorn bags, announcing a new deli surprise in a branded sandwich bag or opening a specialty boutique, Gator Paper is committed to your print needs! 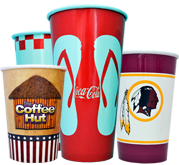 Printing your business name or logo on our cup line is an economical way to promote your business. 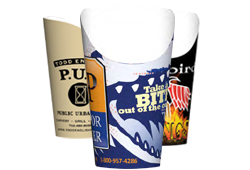 Gator Paper offers a wide range of cup styles and sizes. We offer the lowest minimums in the industry. Our cup varieties consist of Hot Paper Cups, Cold Paper Cups, Translucent Soft Plastic Cups and Clear Plastic Cups. Our Printing has full 4-color process print capabilities. 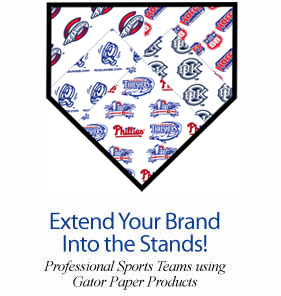 Whether you’re enjoying an appetizer on game day in a team logo Food Tray or advertising your company logo at the office picnic, let Gator Paper bring your branding to life. These versatile paper Food Trays are available in both white and Eco Kraft brown with nine different sizes to choose from. Our custom printed Food Trays are the perfect fit for any size food service project. 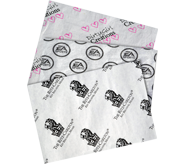 Gator Paper provides you with the ability to brand any item with a 4 color process food service label. This kind of branding is sure to “STICK” with your customer long after they have left your store. 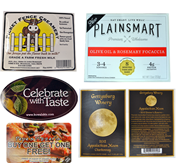 Our high quality custom printed Labels and Stickers are an excellent choice for almost any industry, including retail merchandise, food & beverage, event marketing and more! Our Die Cut Circles offer you the unique opportunity to brand your food in whole new way. 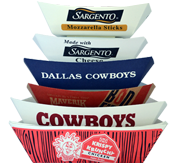 They are a great way to brand food plates and pizza trays. This unique food service sheet is available in several sheet types and sizes. Why use a standard square sheet when a round custom printed Plate Liner will make a much stronger impression with your customer? Our retail packaging sheets are a great way to add a professional look to your product. Take full advantage of the power of branding. Gator Paper makes it easy to provide any customer with a personalized brand message.